The Redfeather Conquest Snowshoes are easy to get into and out of thanks to Redfeather's "stand up" summit bindings. Advanced injection molding technology makes these winter snow shoes super tough. The Redfeather Conquest is a technological breakthrough in recreational snowshoeing for men and women. The Conquest combines extreme "ease of use" with an exceptionally high degree of durability, providing you with year after year of snowshoeing enjoyment. This snowshoe is well-suited for both men and women snowshoers, as it supports weight and gear up to 175 lbs. Even better, the Conquest is also a good choice for the planet. It's created using 100% recyclable nylon material. Highly mobile and sure-footed no matter what the terrain, the Conquest from Redfeather is an excellent entry level, all purpose snowshoe for walking, hiking, general fitness and winter backpacking. Summit Bindings: Injection molded with a rugged "stand up" design for easy entry and exit. The Summit features three straps that secure your foot tightly in place without pinch points. Fully molded sides provide lateral stability yet accommodates a wide range of shoes sizes. Special UV-resistant "Reflex" material maintains a soft feel in the coldest temperatures. Frame: Injection-molded, environmentally friendly nylon that is 100% recyclable and strategically reinforced using Finite Element Analysis for optimum strength-to-weight ratio. Crampon: Hawk™ high quality stainless steel for superior strength. Aggressive toe and heel design insures maximum purchase with each step on all terrains. Powder coated to shed ice and snow. 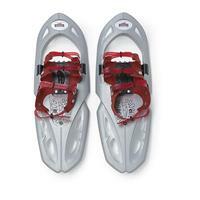 These snowshoes are simple to use and a great alternative to Cross Country skiing. Great fun on your local snow covered golf course. or park.